Sunglasses fashion "drawing on older trends"
The biggest trends in sunglasses at the moment draw inspiration from the last century of designs, an expert has claimed. Dirk Kugelstadt, managing director at MisterSpex, has highlighted the fact that this year"s collections draw on everything, from the fashions of the twenties, to those of the eighties. He emphasised the fact that round lenses will be some of the most popular in the next three months, with a lot of variation within these categories. "Savvy men will be wearing perfectly round sunglasses this season. Whether with a low nose bridge, as was fashionable in the roaring twenties, or with the slim-framed John Lennon tea-shade style. Round is the new black," he claimed. 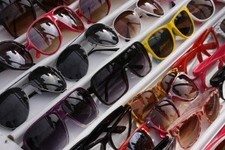 Mr Kugelstadt added that the classic sunglasses designs, such as the Wayfarer style, will also remain perennially popular. Earlier this week, image consultant Colette Ali advised those looking to buy sunglasses to factor their face shape into their decision, as this can have a major impact on how good they look.